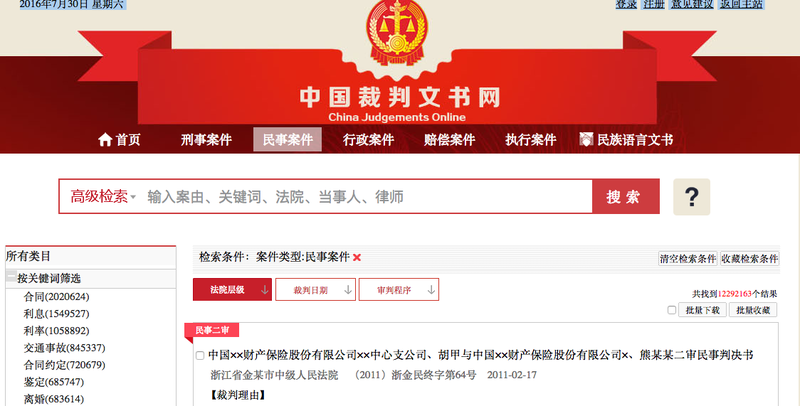 What few recognize is that the millions of non-guiding cases on the Supreme People’s Court’s China Judgments Online website (and its commercial counterparts, such as 无讼(and any internal version that there may be)) are guiding the development of Chinese law, including what arguments lawyers make and how judges decide cases. I note that this coming week’s U.S.-China Judicial Dialogue: In Support of Economic Growth and Reform includes the role of precedent as one of the topics of discussion, and I hope this brief blogpost (to be expanded later) can indirectly contribute to the discussion. The conventional wisdom among both foreigners and Chinese writing about China and case law is that with the exception of a small number of guiding cases approved by the SPC, previous cases do not make law. A significant number of Chinese judges and lawyers follow Wechat legal public accounts. One type of article that frequently appears is one focusing on a specific legal issue and uses the case database to generate relevant cases. A typical example is this article published on 29 July, analyzing six cases relating to changing the name of a child. This type of article affects arguments lawyers make and the judges consider. A second way is judges themselves will search a particular issue to see how other courts have decided a particular issue or the elements to which they have looked when deciding a particular issue. Lawyers perform similar analysis when preparing to argue a case. Additionally, lawyers sometimes submit a relevant court decision when making a submission in an administrative proceeding, such as to the Trademark Review and Adjudication Board and more often, when making submissions to court. Lawyers will evaluate, however, whether the judges hearing the case will take the submission positively or will consider it an indirect criticism of their professional competency. Lawyers will submit cases from courts higher than the court that they are litigating–so that a lawyer litigating in a Beijing district court may attach a relevant case decided by the Beijing Higher People’s Court, for example. Among the many sources of information SPC judges use when drafting judicial interpretations is searches of previous judgments relevant to the issues under consideration, because those will indicate which questions are unclear for the lower courts. Legal services companies, such as Itslaw, are training young lawyers in case searching and retrieval (guiding and non-guiding cases), using keywords analogous to Westlaw’s and LexisNexis’ products. They are doing this training because prior cases are being used in advocacy in China. How are cases from China Judgments Online being used in China in practice? This is where we can see how case law, Chinese style, is developing. The SPC has been focusing its efforts on its guiding cases and it is unclear whether they have noticed this. This entry was posted in Case law and tagged case database, Case law, China judgments online.